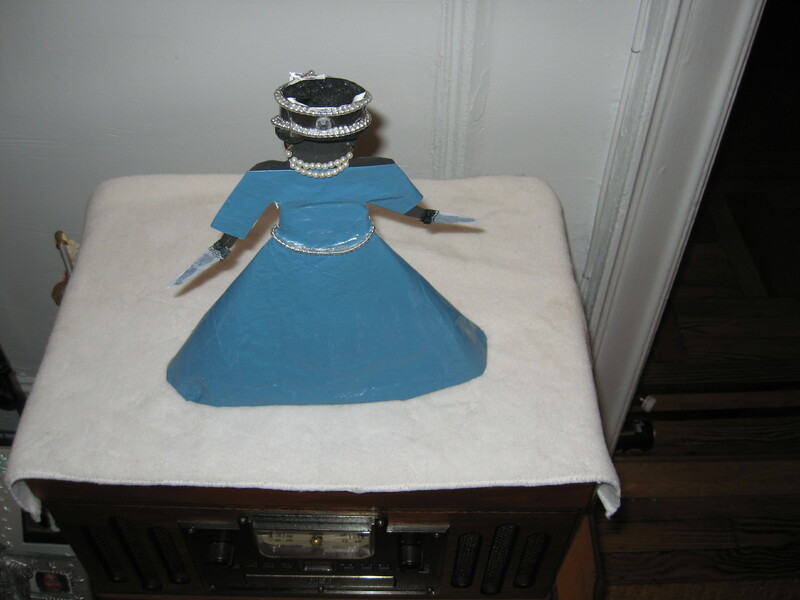 Just as always I’m thinking of how to re-use re-purpose and upcycle things I already have. I had never used food before but I had these mashed potato flakes still unopened. The box I’m sure was its past due date. I was not going to eat it, and couldn’t give it away either. I decided to use it to make an art canvas. 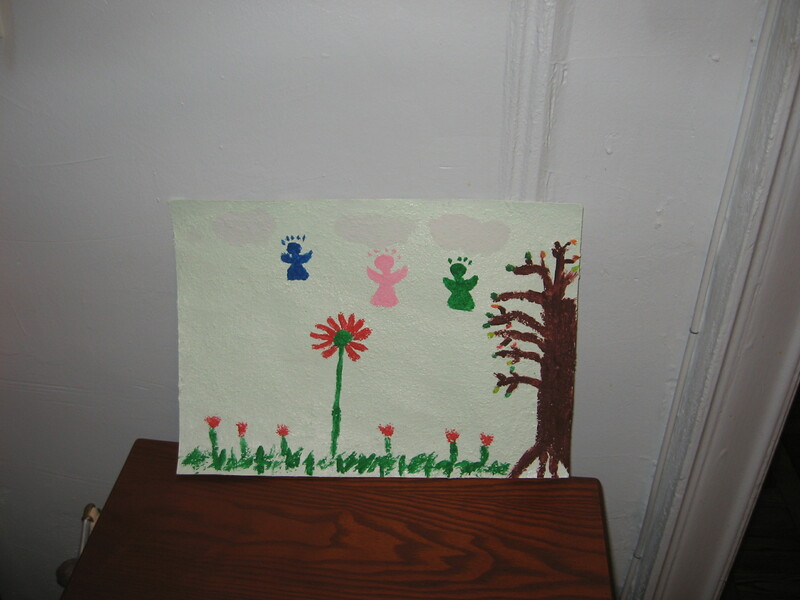 First I painted a piece of very thin cardboard the kind that come in the back of picture frames. I then sprinkled the flakes of mash potatoes and just as it was about dry I coated the “canvas with another coat of paint. 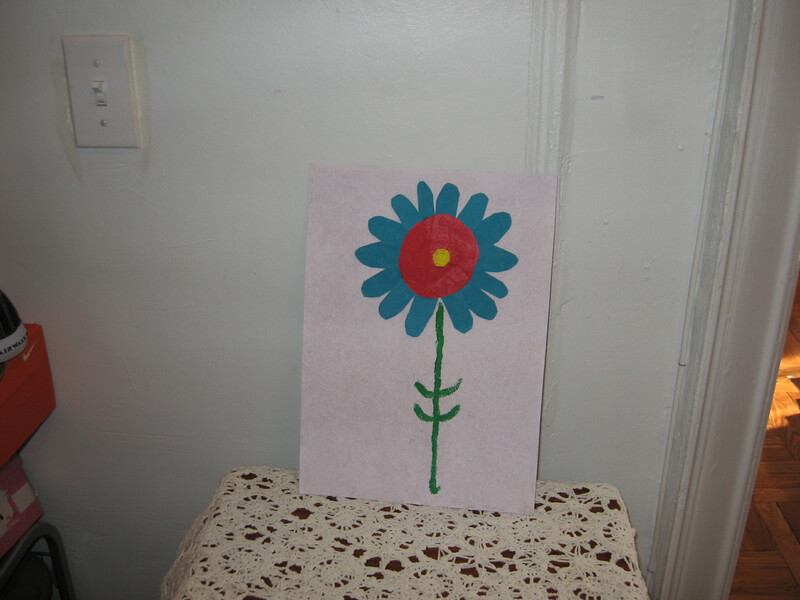 I then went on to do an arts and craft project and was able to both glue and paint on it. Hope you enjoy viewing it. 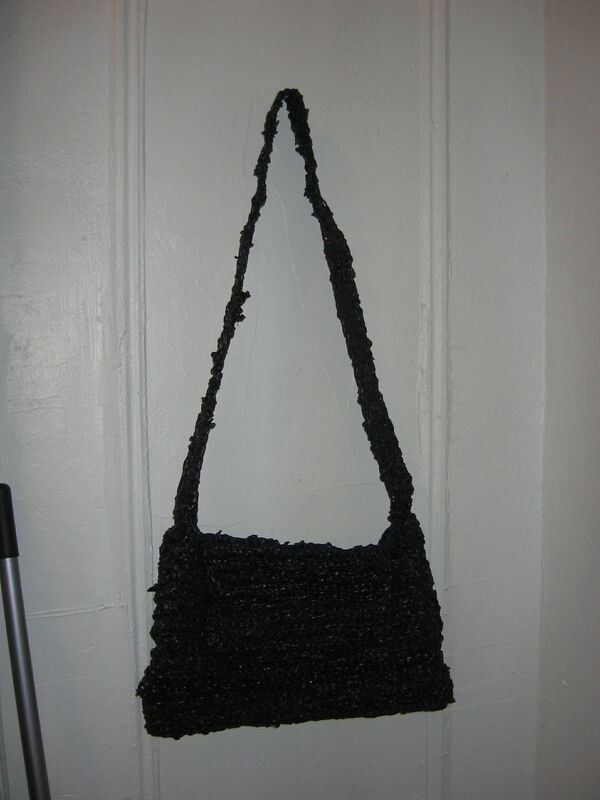 This pocketbook was made out of black plastic bags. It took me a while to put all the plastic bags together and even a bit longer to crochet the bag. But, by the time I was finished even my daughter was impressed. I’m posting a picture. I never get it when people say that so many upcycling projects are so easy. They are not easy but certainly can be done with patience and knowing that some take more time then others, and some don’t quite work out as well as you visualize them. Its being a bit of time since my last blog. I guess with Super Storm Sandy here in New York City and then Thanksgiving it all just became one big blur of time. 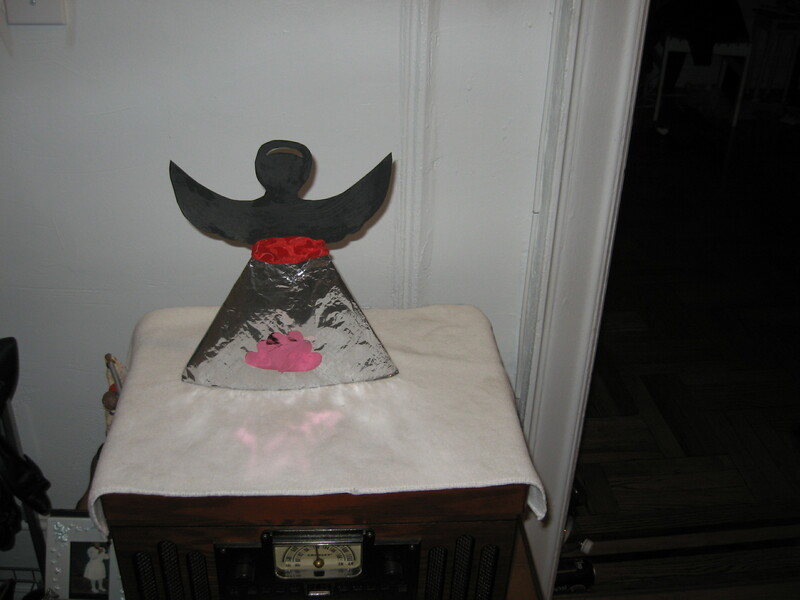 I started some projects and some just didn’t turn out as well as expected, a collage. Some projects especially the crochet projects take an awful long time. 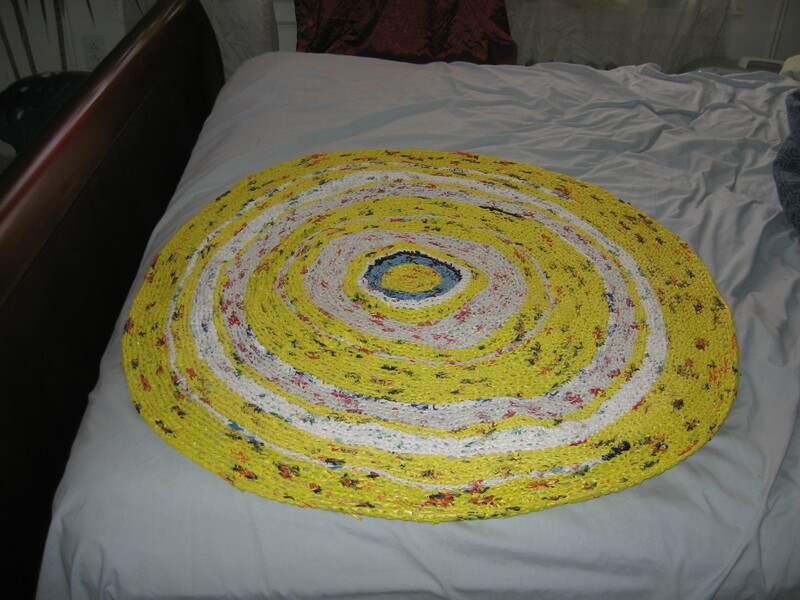 But, I did manage one big crochet rug, and a rosary crocheted out of plastic bags. 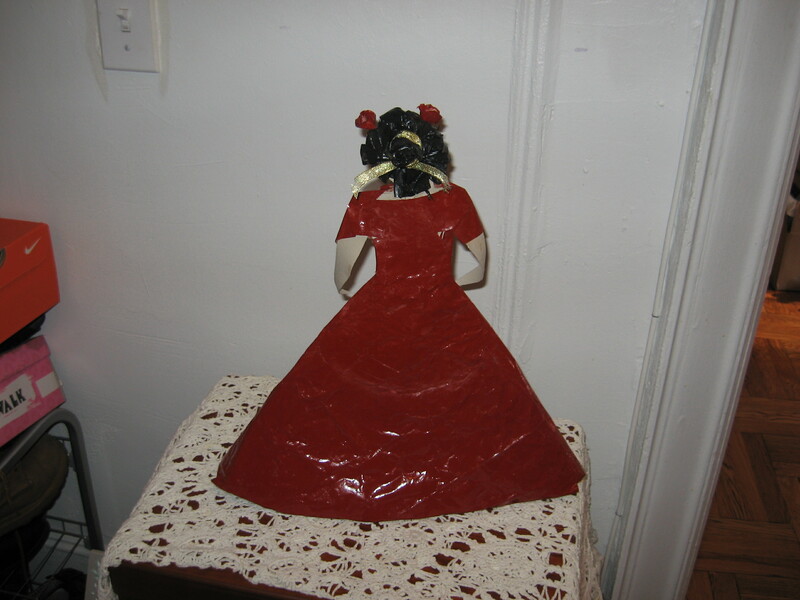 I use plastic bags from anything like disposing garbage, to a shower cap, to crocheting all kinds of items. Hope you enjoy the lastest picutres. 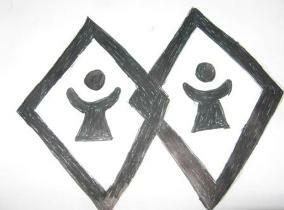 I remember when I was a kid and from movies that kites were very popular, and then they faded. I don’t know of many countries were I have heard this is a past time. But, I just wanted to try a fun project. 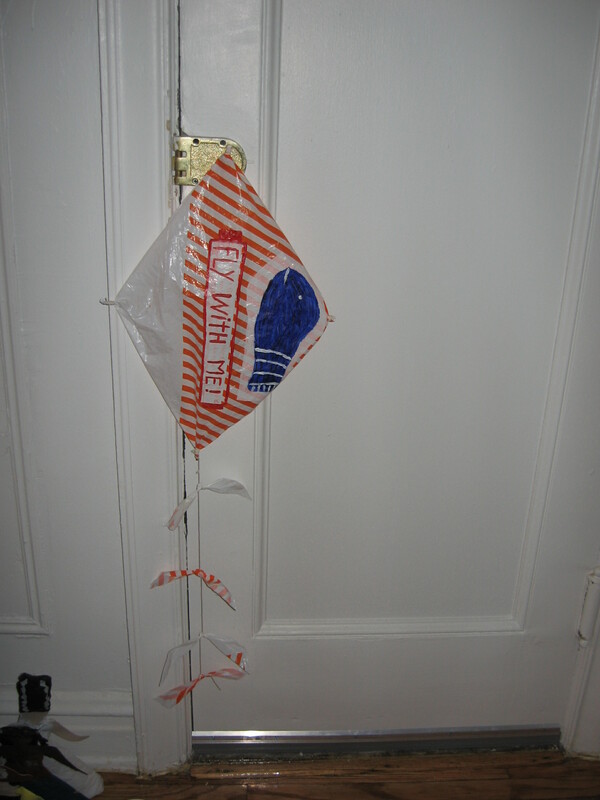 A bit at a time with some internet instructions I made my first kite. Since I live in a city I don’t know if and when I will ever get to try it out. But, I hope I can and that it holds up. 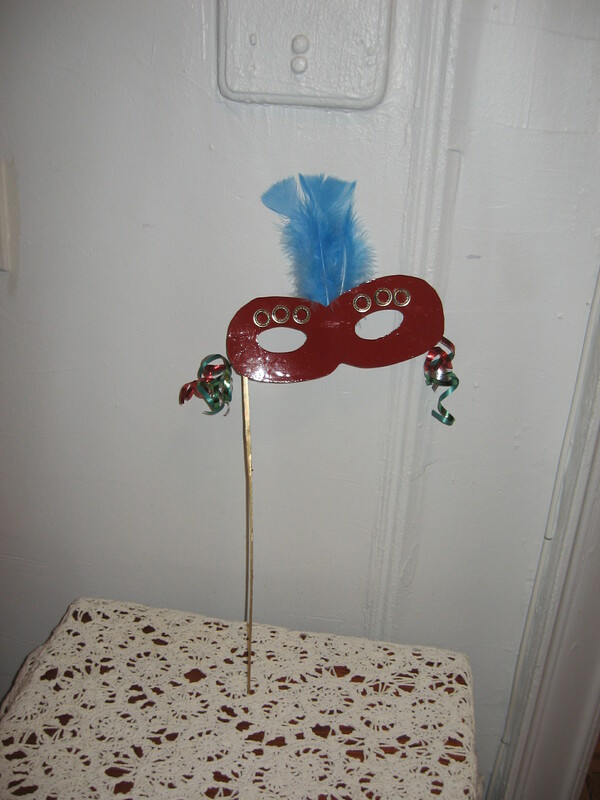 The other thing I always wanted to try to make was a mask that reminded me of Mardi Gras. I have never been to New Orleans but have always loved their masks. 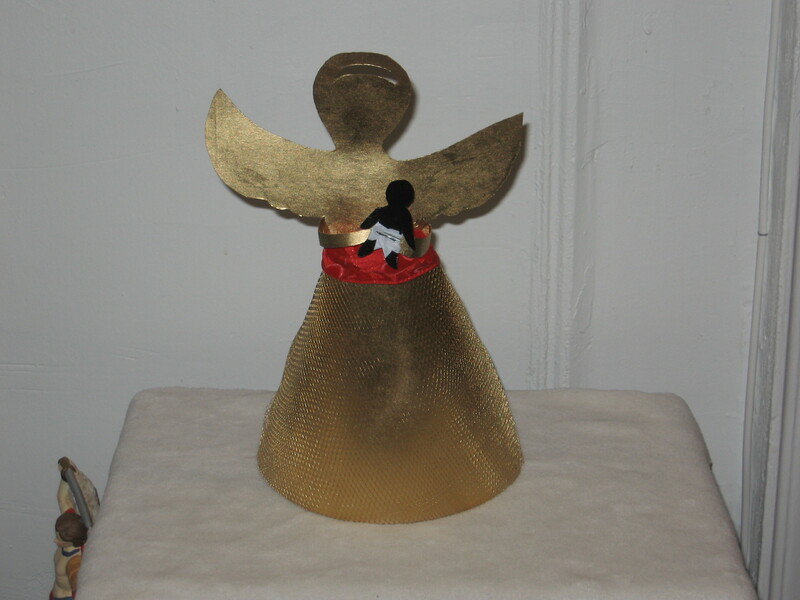 I then decided to try my hands at making one. 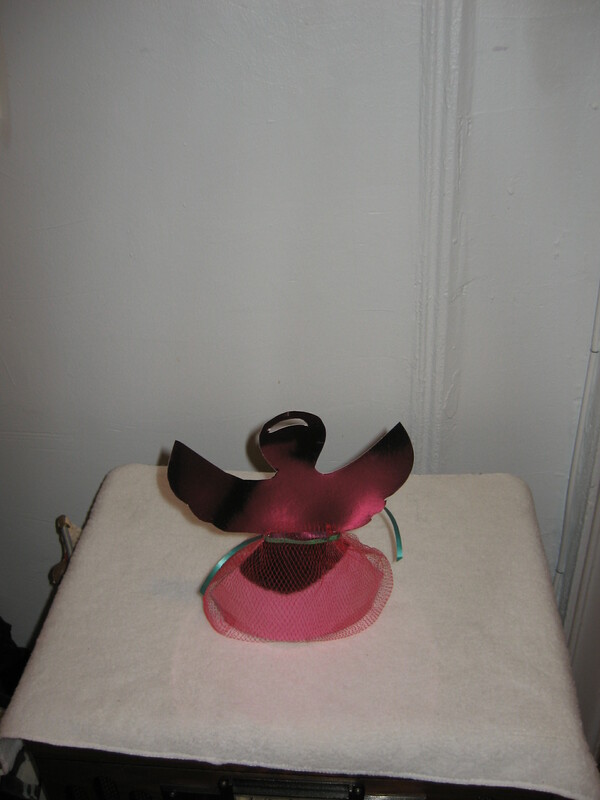 I used shower rings from old curtains, ribbons and paint to make one. Hope you have some traditional fun viewing these pictures. 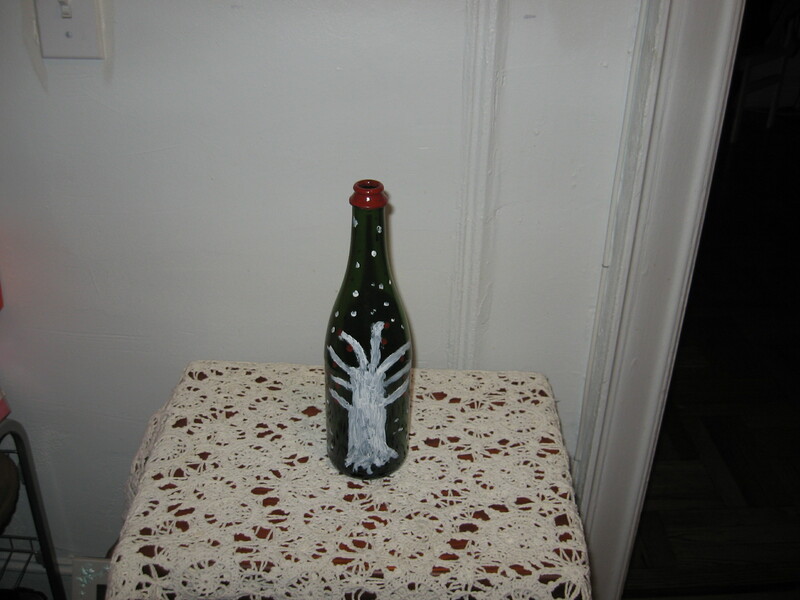 I was just trying to figure out what else I could do with those sparkling apple cider bottles when I just grabbed a paint brush and started painting. I then realized that I was re-creating winter wonder land scenes. Hope enjoy these pictures. 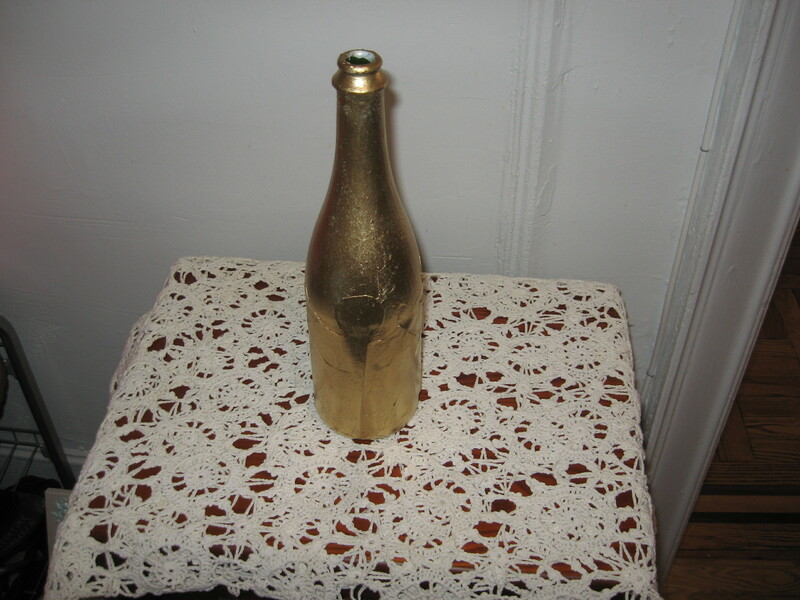 In this blog you will find upcycled cider bottles. 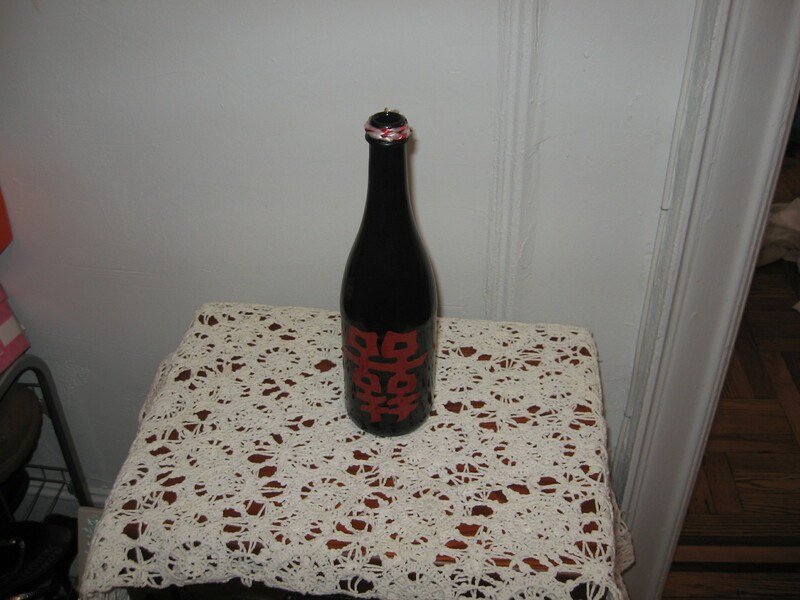 The kind of bottles with that look like wine bottles. 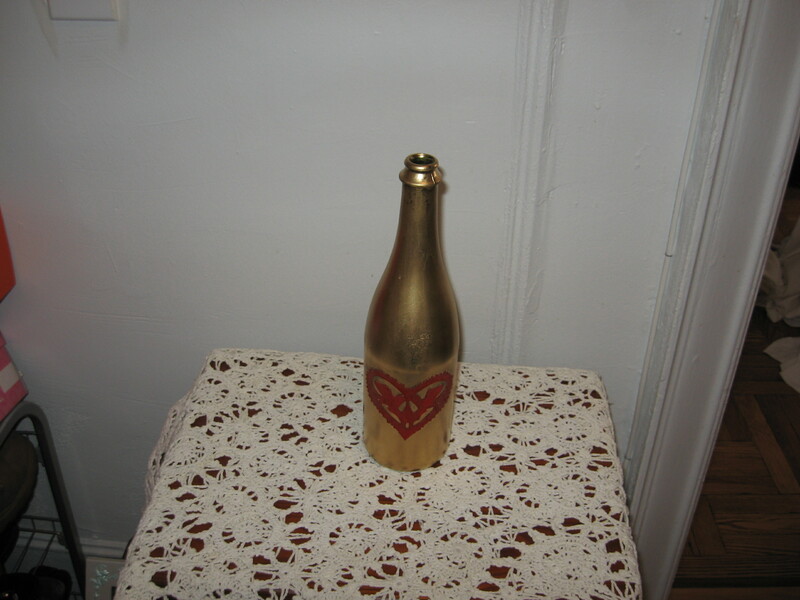 I have taken three bottles and spray painted them hand cut designs on them and glued them on. It was quite a challenge getting the designs to stay on but they did. 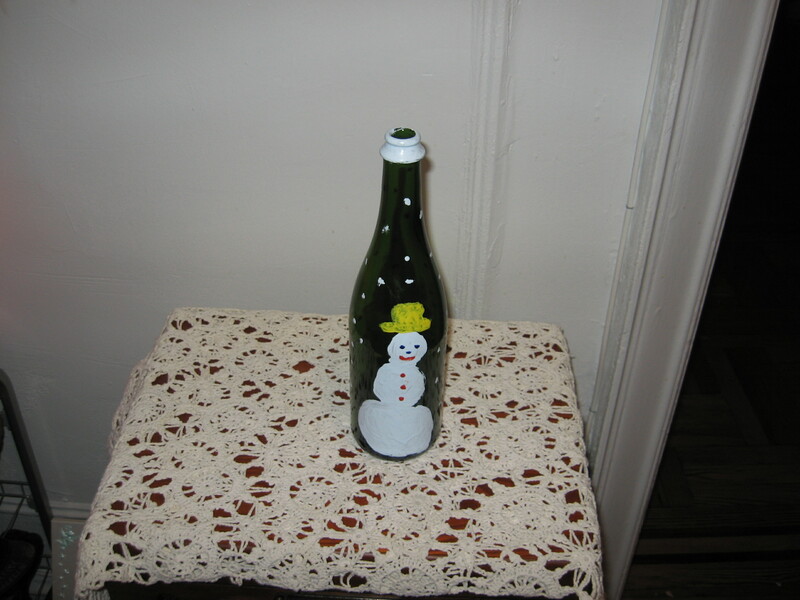 These bottles can easily be used as a decoration by themselves, as a group or even with dry flowers. Hope you enjoy looking at the pictures. I believe we are all still reeling from storm Sandy. It seems it will be a while before life seems normal again. However, life does go on and one has to make every effort to do just that. 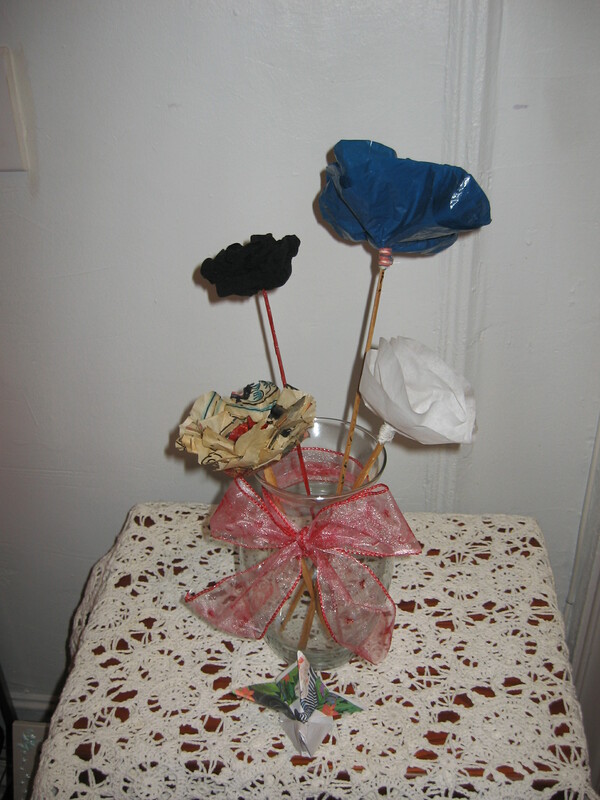 I keep recycling because it keeps me thinking about creating new things and that keeps life going. 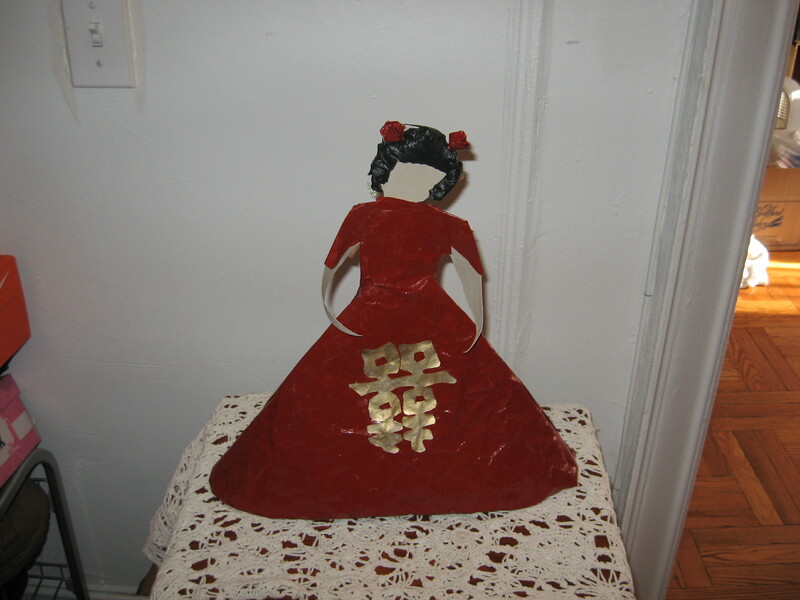 I have included in this blog pictures of paper angels, a queen,and a chineese bride at least my version of it. Happy viewing and enjoy.